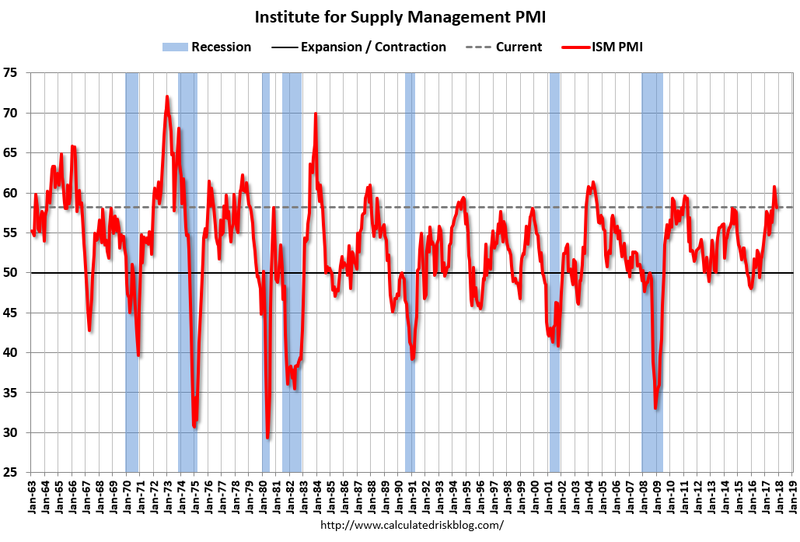 November ISM-PMI Report Down Half a Point- We Think It Is Remarkable! We’d like to provide a wee bit of sensemaking to this report- as normally people would think that a decline in the index is not a positive thing. The absolute values of the index are consistent with Economic activity in the manufacturing sector expanding as well as growth in the overall economy. November value remains above most historical values since the end of the great recession, despite seasonality. We took the liberty of running the ISM PMI averages for January through November for 2014, 2015, 2016- they came in at 55.84, 51.67, 51.22; together, they average 52.91. The 2017 January-November average for the ISM PMI is 57.38. We believe that the data is clear that the process has shifted, in a positive direction. Up 4.47 points 98.4%) over the average for the same period for the last three years. Manufacturing in the United States is performing substantially better than it has over the past three years, and we believe that is is not an anomaly. This entry was posted on Monday, December 4th, 2017 at 6:55 pm and is filed under Front Office, Uncategorized. You can follow any responses to this entry through the RSS 2.0 feed. You can leave a response, or trackback from your own site.